"Where the heck is Goleta?" she asked, staring at her Google Maps, attempting to find the city of Goleta. "You're the one who booked it." he replied, as he fumbled to change the radio station in the car. It was a gorgeous Friday afternoon and the couple was heading to Santa Barbara for the weekend. They were excited to spend a few days away from LA, enjoying the sunshine, the sea, and the food. She sighed, giving up attempting to read the map and reverted her attention back to their scenic drive. "In .5 miles, you'll arrive at your destination." Google Maps said. "Finally!" he exclaimed, exhausted from a long night before and having to drive two hours from LA. They pulled into the lot and she gasped, "OMG it's so cute." 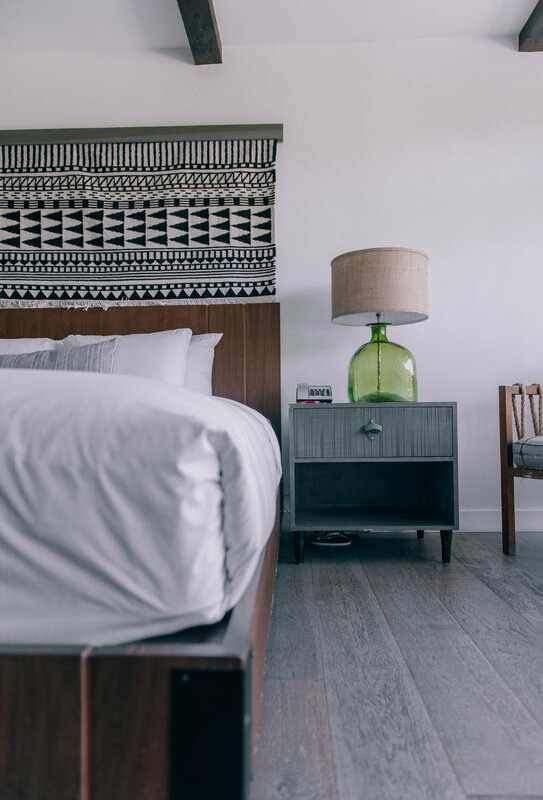 Located in southern Santa Barbara County is the city of Goleta and there you will find one of Kimpton's gorgeous boutique hotels from their collection. The Goodland is the ultimate retreat, guaranteeing you a fun and exciting weekend in Santa Barbara. With poolside sangrias, fire pits for your long night conversations with good company, and a very active event calendar, there is always something to do at The Goodland. Aside from the decor, my favorite part about The Goodland is that it caters to music lovers. As soon as you enter the lobby, you'll notice the VNL record shop to your left. Each room has a vintage-style record player and while there's already a pre-selection of vinyls included, you are also welcome to check out any vinyl of your choice from the VNL record shop during your stay. There's nothing better than grabbing a fresh cup of coffee from their restaurant, Outpost, your favorite record (I chose Gallant's Ology album), and heading to your room to unwind at the end of the night. In addition, you can also purchase any records from the hotel to take home. No matter where you're positioned in the hotel, you'll get a great view of the pool and yes, make sure to take advantage of it while you're there. Sleeping in isn't a sin and there's no guidelines to enjoying yourself once you check in. Let the morning light seep in, put the phone on silent mode, and turn off your alarm because you won't be needing any of this during your getaway. The spacious king suite we stayed in had two bathrooms, a living room with large windows so you can people watch in comfort, a private patio so you can enjoy the sunshine in peace, and a walk-in closet. Not to mention that The Goodland's aesthetic is total goals and if my apartment looked like that, I'd never leave. For a sweet escape from life, The Goodland is my top choice. You're close to the beach, Santa Barbara has a great night scene, and you'll feel like you're home despite being away. Thank you The Goodland for hosting us and showing us a great time. I can't wait to return!